......I finished the Drunkard Path quilt! Yay!! I pieced the top many, many moons ago...actually I can't remember when I started ....I think in the early 1990's and have kept it until now! Well, I did begin this year with the resolution to complete this quilt and ta-da.....it's FINISHED! Ok....I confess that it's not a quilt in the true sense, as I did not use batting.....only the front and the back and in our hot weather, it will be enough for cover up on a cool night!! *grin* Another confession.....the curves are not really pieced, but appliqued using a full circle on a square, then cut into quarters and pieced in the drunkard path design! Anyway, I'm happy that this quilt is completed at last!! PS. Found out that this is my 100th post!! Congrats! Looks cosy! And many more to come! I live in the Silver state of Malaysia aka the Land of Grace. Married to a wonderful guy and has a daughter who has completed university and is now seeking a job. My passion is crafts esp. 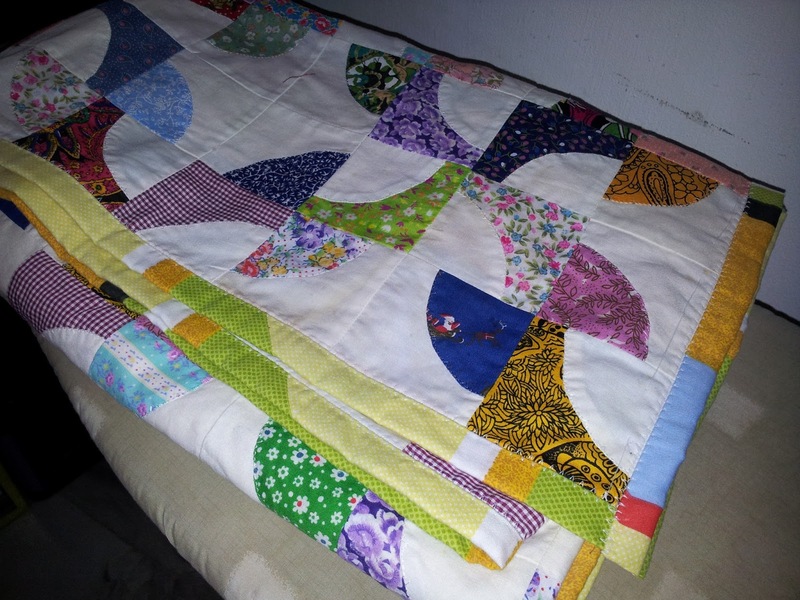 patchwork & quilts, cross-stitch, reading, etc.